The Hell Hammer was recently observed operating with Chaos Raiders along the Eastern Fringe. many Imperial Navy Strategos believe it to be one of the dizzying number of designs created by the traitorous, mad Magos Cy-Belle. Prior to his defection after the battles on Rutilus, such craft had not been observed. in addition, Chaos Raiders had never exhibited the tactic of "dive bombing" previous. However, this conjecture can not be confirmed. Some in the Imperial Navy suggest that battles with Ork forces in Wilderspace naturally led to the creation of the Hell Hammer. No matter the truth, the Hell a Hammer is yet another dangerous tool in the Chaos arsenal. The Hell Hammer is primarily a ground attack aircraft. The large engines, narrow control surfaces, and extended internal bomb racks make it suitably dangerous. This configuration seemed to be focused around the tactic of dive bombing. In such a maneuver the aircraft power dives at the target to ridly close the distance. At the apex of the dive, the craft pulls up and away. This reduces the chance of interception by ground weapons and enemy fighters. Just as the craft pulls away, the bomb bays unload a cluster of small bombs. The dives momentum then carries the mass of explosives into the target below. Due to the Hell Hammer's role, most of its anti-air weapons have been stripped out and replaces with lighter and smaller heavy bolsters. This allows it to carry a larger bomb load for its true purpose, ground attack. Like all Chaos Raiders the Hell Hammer is relatively fast and maneuverable for an aircraft of its type. However, like all Raiders the techno-sorcery used in their construction tends to make them unstable and fragile. They tend to explode from even light damage. Below is a pair of Hell Hammers associated with the Cabal of the World Walkers, a trench aligned warband. They are currently believed to be in the employ of Mistress Merciveaux in the edges of the Old Guard Stars. Interestingly, Mistress Merciveaux is also the patron of Magos Cy-Belle. 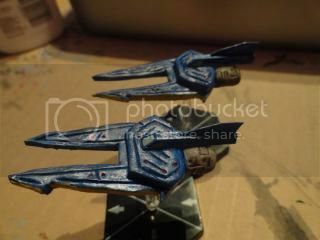 I managed to sculpt and paint these in a single evening. As usual, the bodies are sculpey while the cockpit is a bit of spruce. The tail is a bit of card stock/thick paper. I am intending to play an Air Defense Suppression mission against my skumgrod and needed some more ground attack. I had used some small missiles on my Herald, and couldn't find where I put them to make a few more of them. Therefore, I opted for the Hell Hammers instead. We will see how they do. Do you like Free Wargames?